"OHH the balloons were a great success, th﻿e children loved them, and kept them happy the whole time. "Wow the balloons were amazing!!! Thank you so much!! The day was so lovely & very 'pink'! I loved every second. 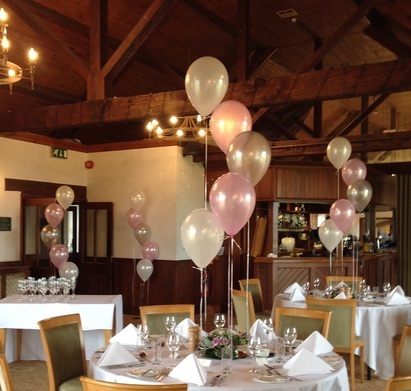 Thank you for your help"
Just wanted ﻿to﻿ say another very 'Big Thank you' for making the room look so fantastic for my husband's birthday party at the Golf club on Sunday. He thought the room looked amazing and there were lots of comments from friends too! It was a great night so worth all the effort. "Thank you so much for the beautiful balloons for our daughters 18th party tonight. They are amazing!!" "They were so good. Everyone thought they were amazing. And they are still going strong a week later!" " Thank you so much for the balloons on our wedding day. They took our breath away when we walked into the hall. A perfect job. Thanks again"
“Thank you so very much for the beautiful display of balloons! They really made the barn look stunning. Can't fault a single thing on the service and the end result you have given us. "I would just like to thank you very much for all your hard work in decorating The Rectory for our Wedding, the room was beautiful. We have had a lot of comments on how stunning and how all the colours matched throughout. The floor walkers were an amazing talking point and are still going strong." "I just wanted to say thank you so much for doing the tables! You did a fantastic Job and everybody commented how nice the room looked." "The balloons looked fantastic and were a real hit with the children; we were really pleased with them. I had several comments from parents on the balloons - loving the plastic bangles. It was so nice to watch the children running about with their balloons after the wedding breakfast. My daughters' balloons are still going strong, almost two weeks after the day!" "Just a note to say thank you for doing the balloons for our wedding; they looked great. I’ll certainly be recommending you to friends in the future."